My most distinct memory of the modern musical rendition of “Hallelujah” happened in the attic of an old canal-house in Amsterdam. Chris Smith. 2003. The musician was a highly-talented guitarist and vocalist, but he was also a friend and co-worker of mine. Picking the strings of his guitar and singing the words in his distinct style and voice, he moved me to the point of tears. Even though I had likely heard the song previously and I certainly heard it many times thereafter, it’s that one performance of the song that sticks with me. At subsequent open-microphone events and informal jam sessions, I would ask him to play it again — but he always refused. He has since recorded a version of the song for YouTube (accessible above). Though it’s not exactly the same as that one night in the zolder, the song has remained one of my personal favorites. 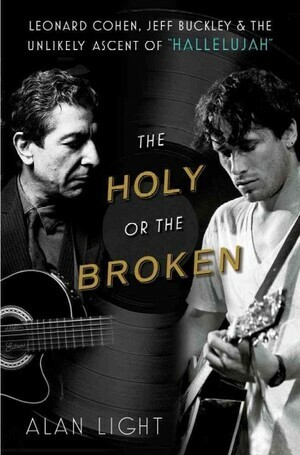 So when I saw Alan Light’s new(ish) book, “The Holy or the Broken: Leonard Cohen, Jeff Buckley, and the Unlikely Ascent of ‘Hallelujah,'” I jumped at the chance to read it. I found the book to be very well-researched, even if not particularly eloquent (it has the feel of a very extended magazine article). I was fascinated to learn more of the stories behind this song and the way it rose into the public consciousness — very unique from most popular songs. And I was intrigued by all the angles that have been explored in relation to this song through the years. The lyrical mix of sexuality and spirituality has been interpreted dozens of different ways, depending on which verses have been included and in which order. But the haunting melody and the simple one-word chorus dominates — to the point that it’s become something of a secular hymn in our culture today. There are days, I am sure, when you and I and even the great King David could only muster a cold and lonely Hallelujah. It may be that the cold and lonely Hallelujah is a turning point that marks our salvation, because we know only God can save us from some of the situations we find ourselves in. The cold and lonely Hallelujah is a surrender to the mystery and backhanded glory of God. The hallelujah being declared is not from a confident and victorious believer who has seen the light, has the answers to everything, and is entitled to God’s blessing and salvation… I think it is a song of praise for those who have experienced loss, pain, and sin in life and yet still believe God can reconcile and even redeem the things that we cannot. I recognize, of course, that other people are entitled to dramatically different interpretations of the song — and it will always mean different things to different people. But to Rev. Scott’s thoughts, I say Amen. This entry was posted in Amsterdam, Amsterdam50, Culture, Music, Nostalgia, Reading, Recommendations, Recommended Listening, Recommended Reading, Recreation. Bookmark the permalink.